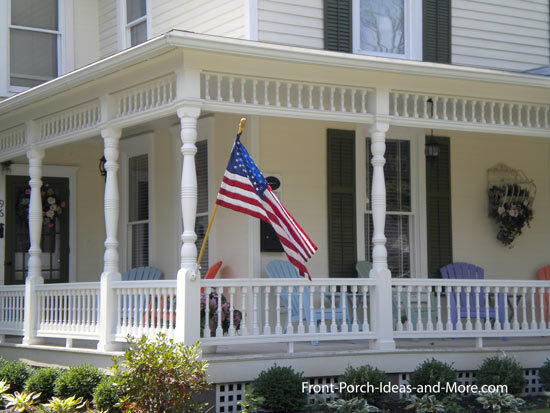 Front porch columns are not only functional but also can be decorative as well. 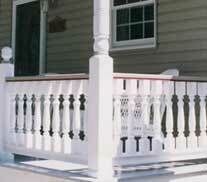 Use them in conjunction with your porch railings to enhance the look of your both your porch and home. 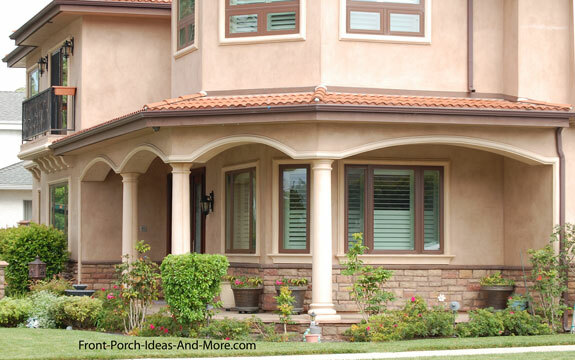 Whether you are looking for something to just support your porch roof, want to match your home's architectural style, or want to use them to create lots of curb appeal, you've come to the right place for column ideas. In addition, you'll find options for repairing or replacing your columns if that becomes an issue. Use our directory to find specific information about columns. Want the authenticity of Greek and Roman architecture? 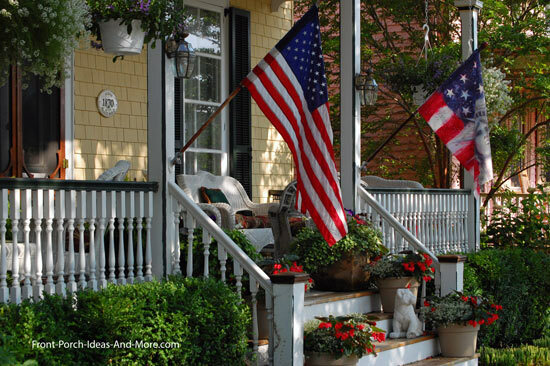 Front porch posts not only help define the style of your home but also make your porch more inviting. Don't limit yourself to just the classic columns. 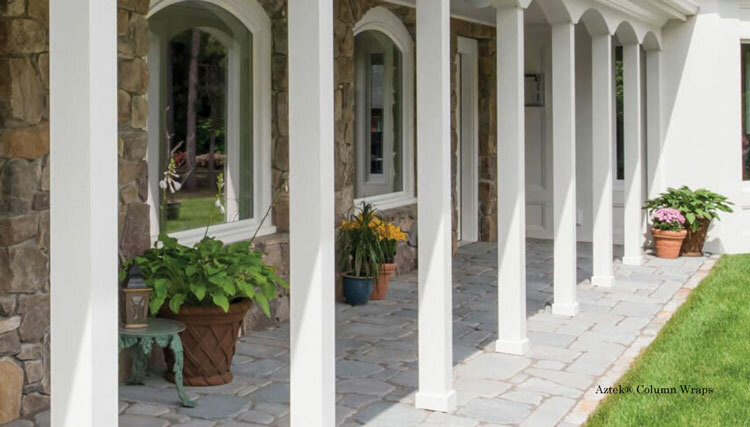 Whether you are replacing columns on or porch or selecting ones for a new porch, style and the column material itself are important considerations. 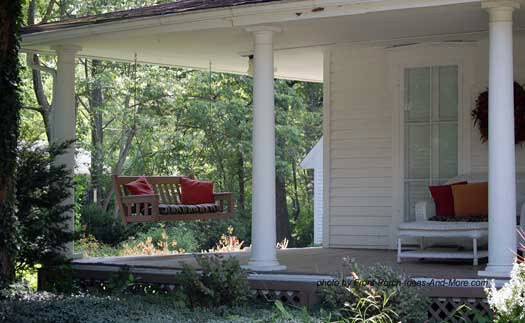 In fact, porch column styles range from the very simple to artistically beautiful. As long as they satisfy your load bearing requirements, almost any style will do. An important consideration when selecting columns are the materials from which they are made like wood, composite, fiberglass, wrought iron, and many more. 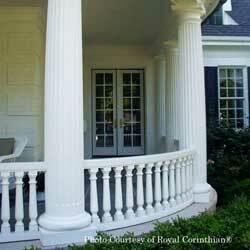 See our Ideas for Columns page to help you select the right material for your porch columns. 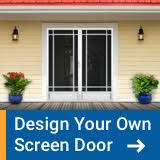 If you are looking for do-it-yourself products for your porch, you way want to view our Porch Parts Resources section. 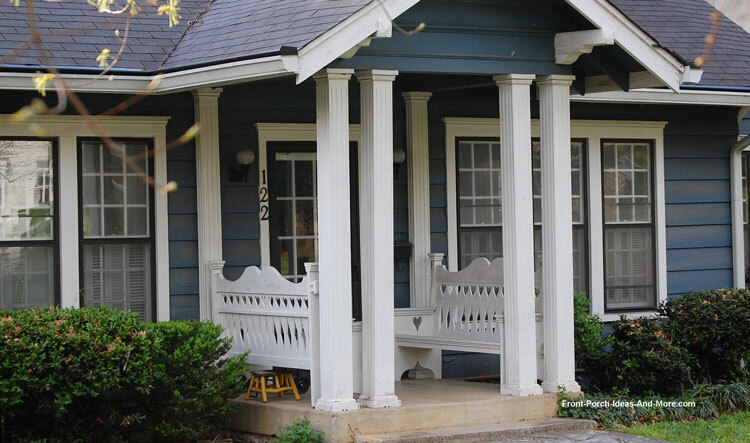 We feature Vintage Woodworks who carries a wide selection of columns, column wraps, and porch posts to create a beautiful curb appealing porch. The most prevalent column designs on residential homes are square, rectangular, or round while others may have turned posts. Although you may see a few of those below our intent is to give you other column ideas you may not have previously considered. 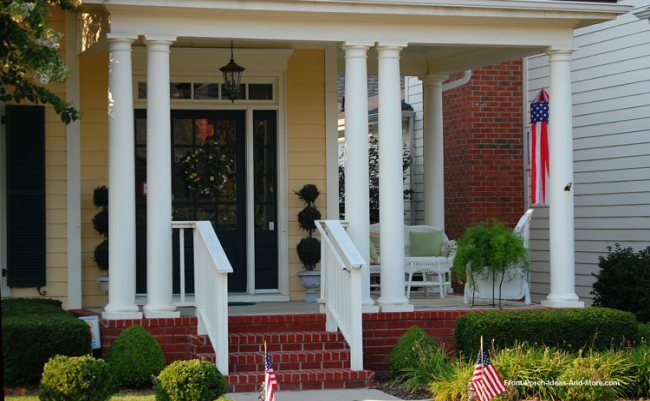 Matching your columns to your porch's architectural style can dramatically improve your overall curb appeal. Using the photos below, note how the columns match the style of the home or the size of the porch itself, two very important considerations. Small diameter or thin columns can appear disproportional and look as if they cannot support the roof. However, posts can be used in groups which helps not only disperse the load but also adds to the overall appeal. The square columns in the photo below seem to overwhelm this small porch. The double column design in front isn't needed to support the roof; however, they do add additional privacy for those sitting on the benches. Also take note of two other features. 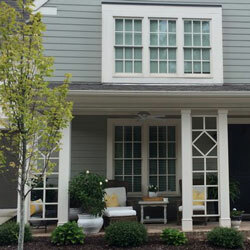 One, both the columns and benches are painted white to match the window trim giving it a very cohesive look and two, two faux columns (not needed to support the roof) were added against the house wall completing the design. In the photo below, aluminum columns with brackets (at the top of the columns) support the roof structure. Aluminum is almost maintenance free and a good column material. 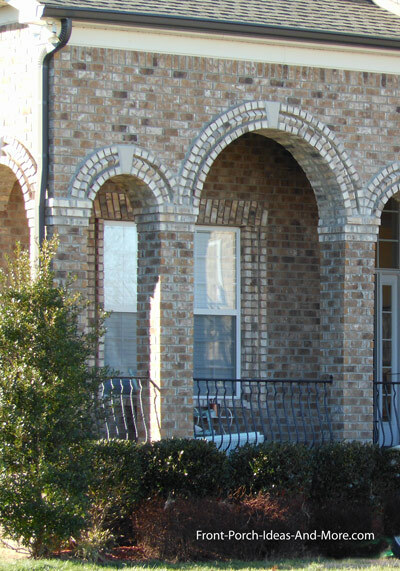 In this case the aluminum columns are dressed up with lattice-type inserts which add to their overall appeal. Good example of turning something ordinary into a more attractive display. I really like these. Look closely at the columns below and note how the wood columns are actually four posts attached together to form a very appealing and unique column. 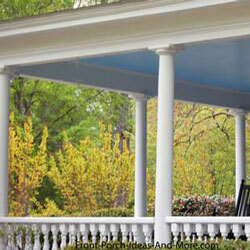 Sitting on brick pedestals which are painted blue to match the porch floor, these columns have great curb appeal. Usually column placement is not an issue. 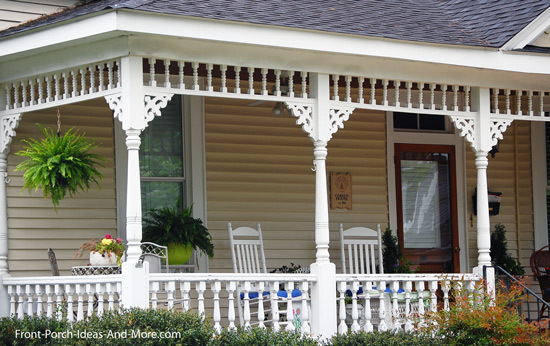 Porch columns are positioned according to code in order to support the weight of the roof. However, we've recently noticed that many home builders are (in our words) "going crazy" with columns and adding additional ones for aesthetic purposes. There's absolutely no problem with that but additional columns can hinder your view and take up additional space on your porch. In addition, some builders are adding pedestals to the columns which further block your view. 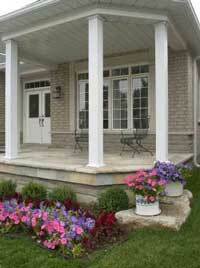 If you are building a new home, consider your view and the depth of your porch when planning for your columns. 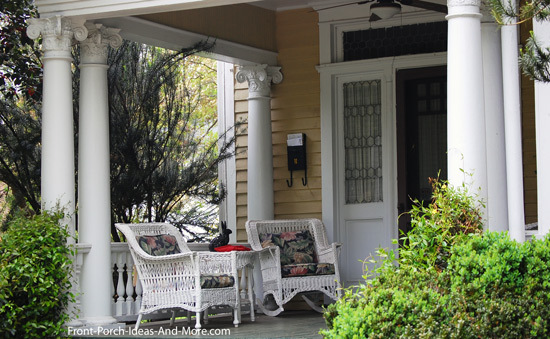 If you have an existing porch, the extra columns can be removed in most cases. If so desired, contact a local contractor for both estimates and to determine how many, if any, columns are not needed to support the roof. Check out the two photos below. These are examples of using double columns on pedestals with columns and pedestals of different heights. Normally, columns and pedestals of this size are found on larger porches like those in the photos; they take up too much space for small front porches and would obstruct your view. 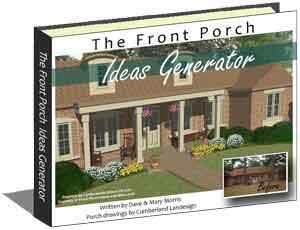 The porch on the photo above is a large wrap around porch on a gambrel designed home. The home below is an arts and crafts design. Both have brick pedestals and painted to match the color of their respective homes. The photo below shows double columns spaced a little further apart on stone pedestals. Singular columns of the same size would would give this porch a totally different look. 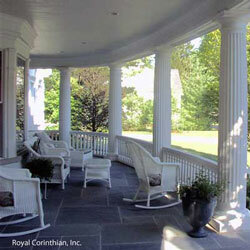 This porch is fairly large and can accommodate column groupings with ease. This arrangement gives the homeowners lots of privacy too. You can use double columns with pedestals too as in the photo below. 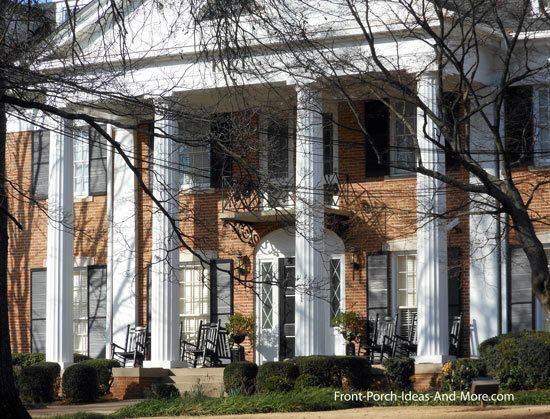 In this case, round tapered columns with capitals give this porch a more stately appearance. The porch roof below is supported by large brick columns. Larger columns will inhibit your view but also offer a measure of privacy. I wouldn't mind spending an afternoon on this porch. 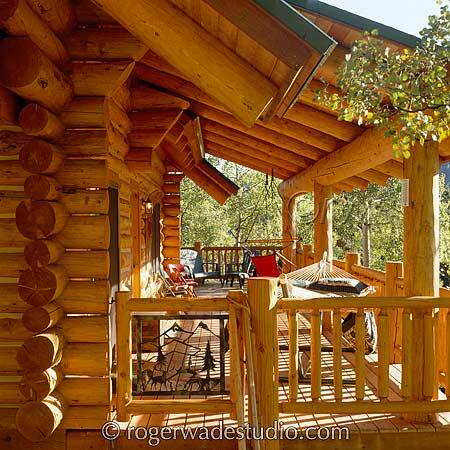 Would love to have a log cabin. The large log columns support the log beam and roof of this beautiful home. Using smaller diameter columns for this porch would not work. One, they wouldn't be sufficient to hold the massive roof structure nor would they be proportional to the home. This timber-framed home has timber columns on stone pedestals supporting open gable roofs. This unique porch definitely has lots of curb appeal. 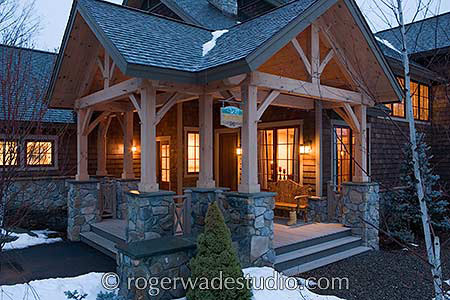 Our thanks to Roger Wade Studios; if you like log home and timber frame homes be sure to see our entire Roger Wade Studios section. 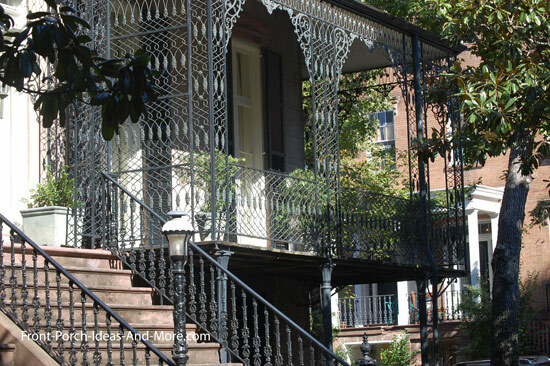 Wrought iron can make for some beautiful porch columns like those in the photo below. It can last forever and with today's processes takes only minimal maintenance. Because it is usually custom made you can create some very artistic columns and railings. Turned columns like those below are quite common. 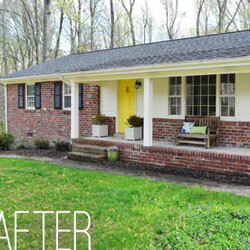 But note how you can enhance their appeal with exterior house trim (see our curb appeal section below). We found these on a trip to San Francisco (below). They have an almost gilded appearance and appear majestic in both size and color. The capitals at the top of the columns give it a sophisticated look. Adding moldings to your square or rectangular columns can enhance their appeal also. 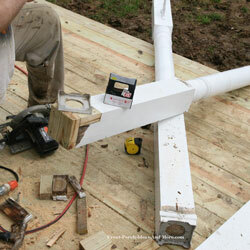 Experiment with the type and location of the moldings on your columns to see what works best. 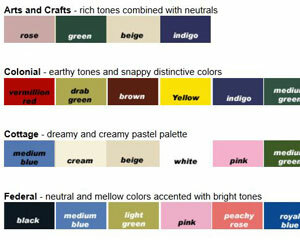 Then try different paint combinations to see what has the most appeal. In the photo below, a type of crown molding was placed about eye level when standing on the porch. The colorful column brackets add a nice touch too. 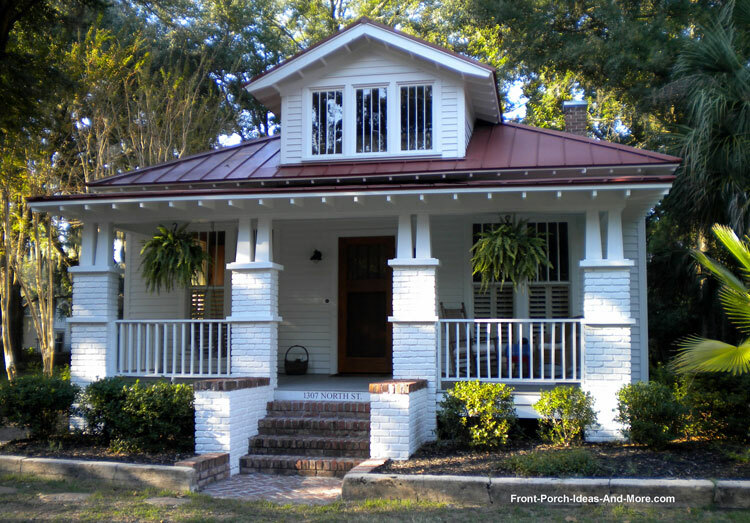 Porch columns or porch posts can be of any design as long as they meet structural requirements to support your porch roof. 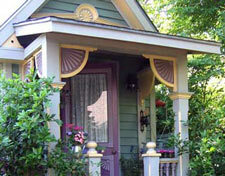 Porch columns can also be made from some unique and unusual materials as well as shown below. 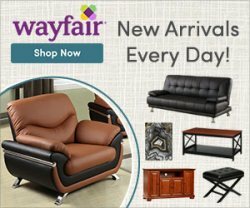 We have more column designs in our curb appeal section below. Most people don't realize the potential their porch columns. 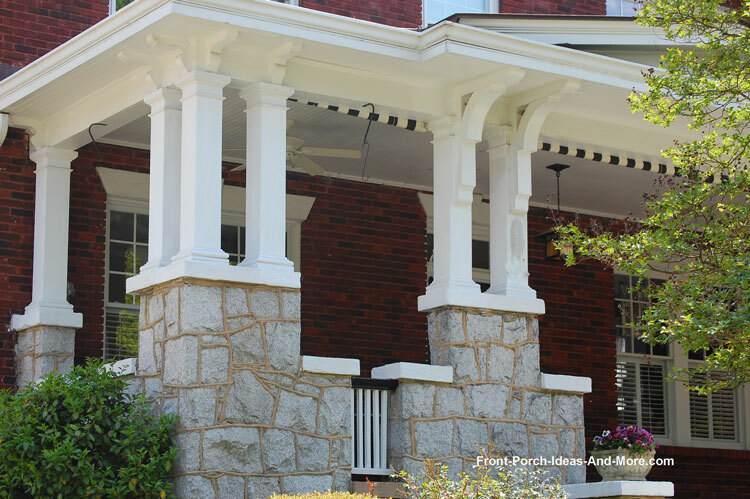 Besides holding the roof, porch columns can be used to add curb appeal and enhance the overall appearance of your home. 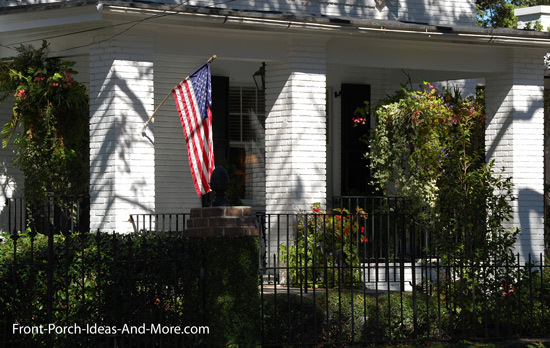 The two easiest ways to achieve appeal is by painting and/or adding exterior house trim. You can do either fairly quickly and you will be very pleased with the results. Don't be afraid to experiment with paint - you can always paint over it for a different look. 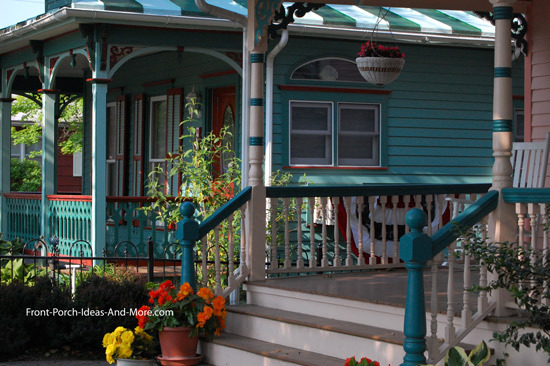 Mary and I selected several front porches with painted columns and trim to get you inspired! 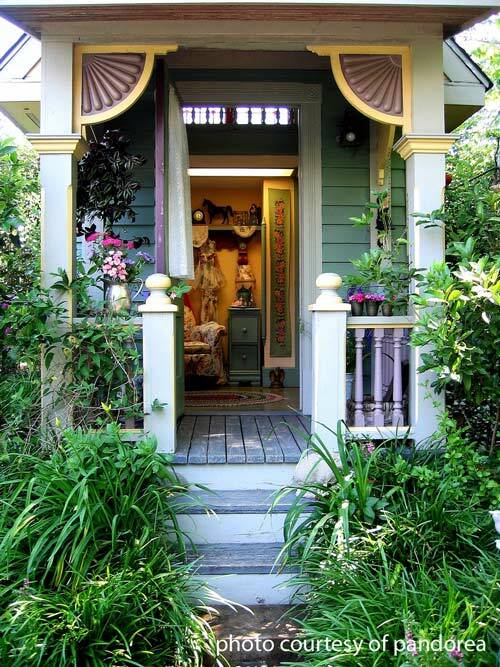 Victorian style porches are a big hit with us. 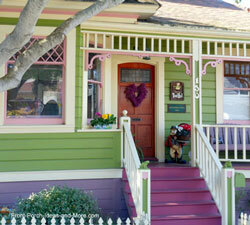 The colorful turned columns in the photo above match both the style and size of the porch. 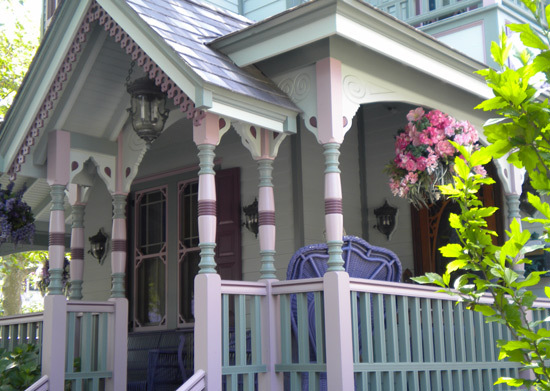 Victorian porches can give you great examples of paint schemes you can use in part or whole on your own porch columns. 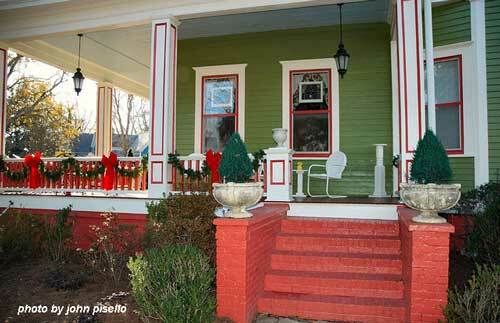 Here's two good examples (above) of Victorian front porch columns, one turned and the other squared. Again, color plays a major factor in their appeal. As you can see you don't need turned columns to make an impression. 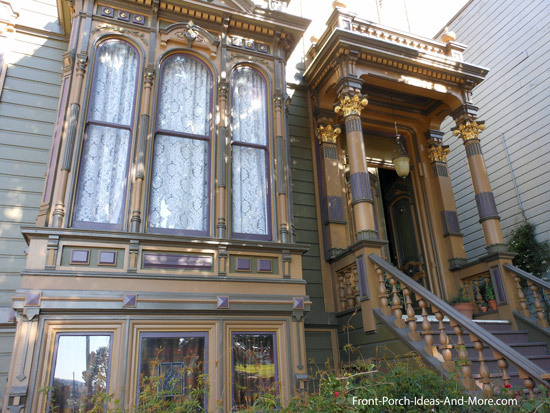 One of very favorite Victorian front porches. 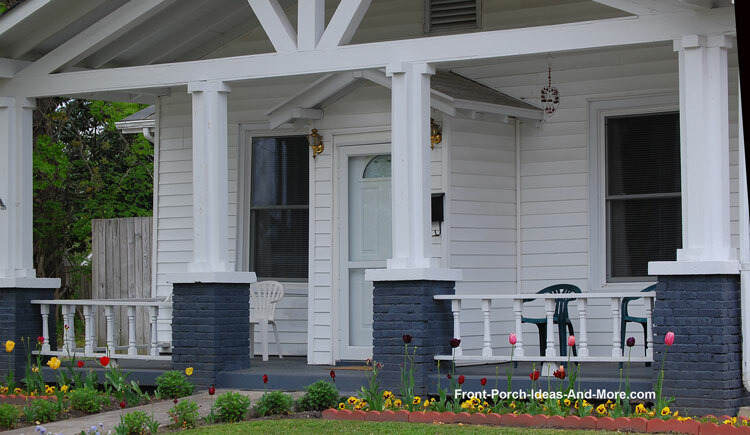 As you can see, painting porch columns is one way to achieve curb appeal on a massive scale. 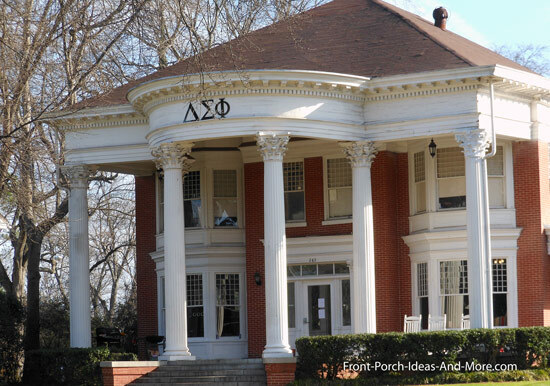 This porch would also have great appeal if the columns were a solid color. 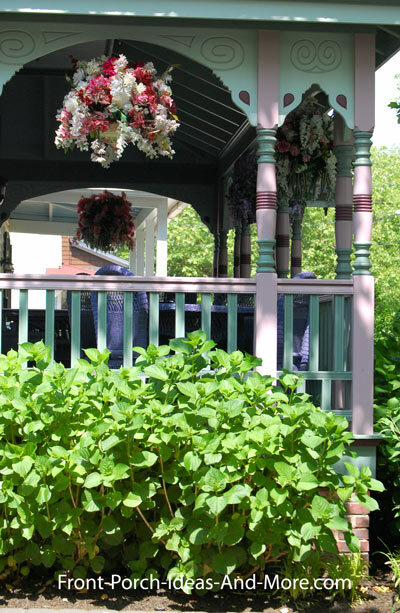 Adding colorful hanging baskets (above) is yet another way to draw attention and frame your front porch columns. Experiment with complementary or contrasting colors for different affects. 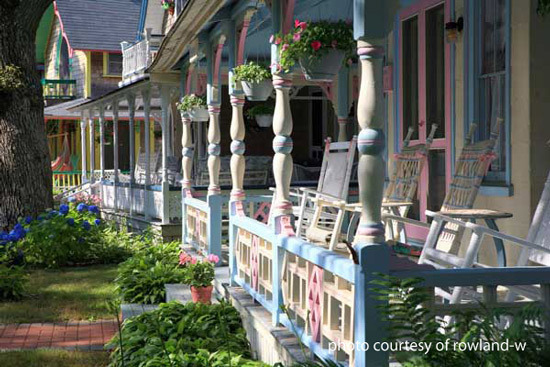 See more photos of John Pisello's magnificent porch! We've added a few examples of columns that are not of Victorian style for more ideas. Paint is your friend. 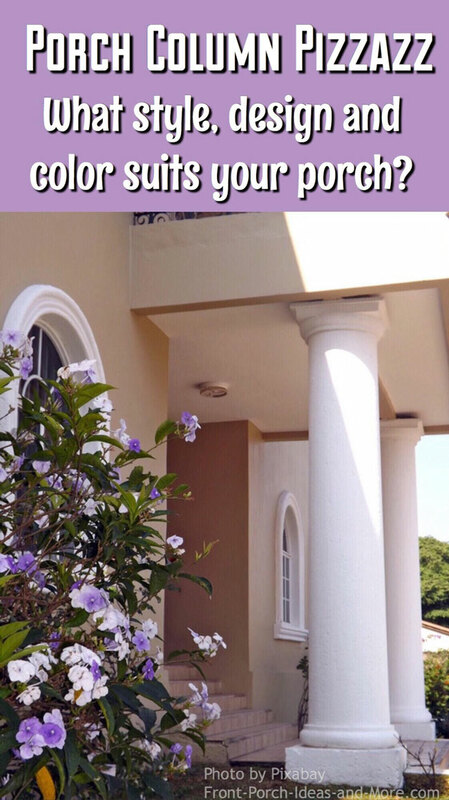 Note the impact of adding color to your porch columns in the photo above. The color in the columns above match the color of the window trim which adds some really nice appeal. You can do this easily with just paint or for an even more dramatic touch, use painted moldings to give your columns more depth. Good example (above) of using a darker shade of your home for the columns. If your home is of a darker color, a lighter tone on your column would work well too. Often times just "a little dab will do ya"! The column edges (above) are painted with the railing trim color. Easy, quick, and charming. 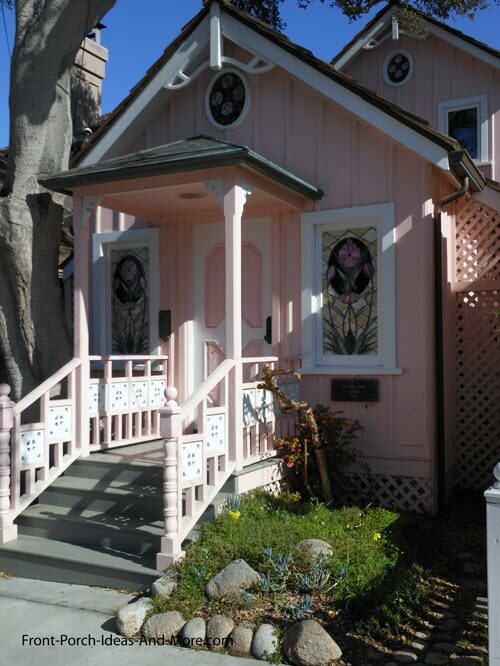 Paint your columns (above) the same color as your home - think pink! 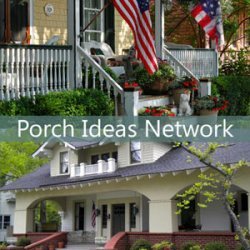 Need Help with Porch Paint? See our porch paint section for more painting ideas along with color charts to ensure you select the right colors for your style home. 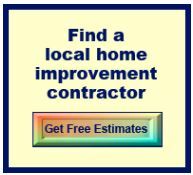 You will also find references and information regarding the best paints to use on your porch. Stop by our porch paint section. 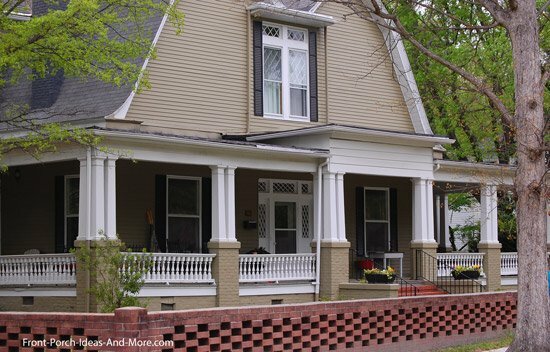 Another way to dress up your columns is by installing exterior house trim. 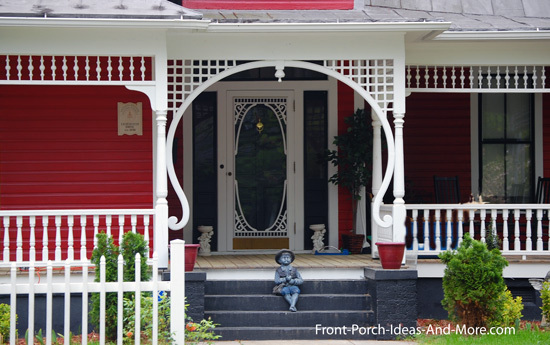 You do not have to have a Victorian porch to use trim; it can add appeal to any porch. It is easy to do and you can mix and match components to create different effects. Note the turned front porch columns with brackets and spandrels (above). 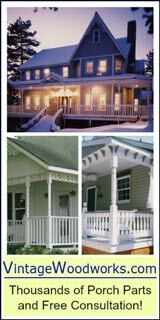 Adding exterior house trim to porch columns, like brackets, spandrels, and running trim can add immense appeal. It makes for an easy DIY project too. 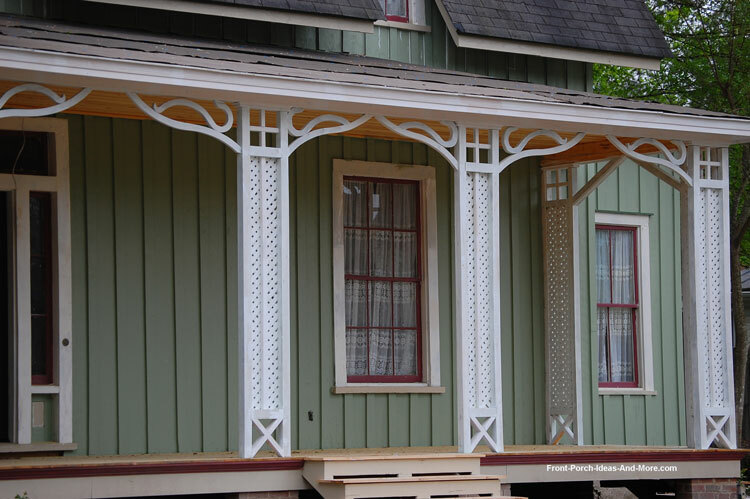 Although true country porches don't usually have exterior trim, spandrels give this large country wrap around porch (above) a little pizzazz! You could also add column brackets too. You don't need a lot of trim as evidenced by the brackets on these columns. 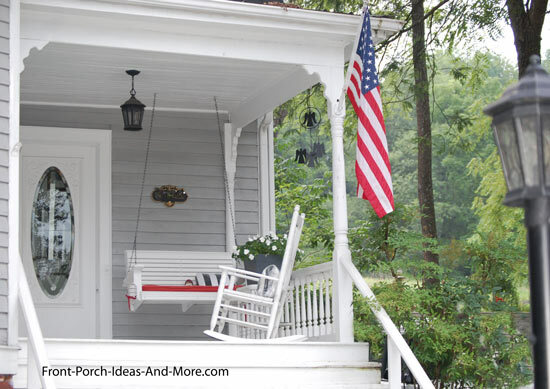 Would You Like More Porch Trim Ideas? 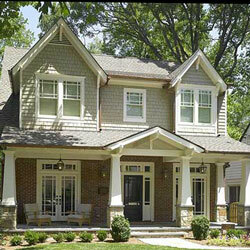 Our exterior house trim section will give you a myriad of ideas for your porch. 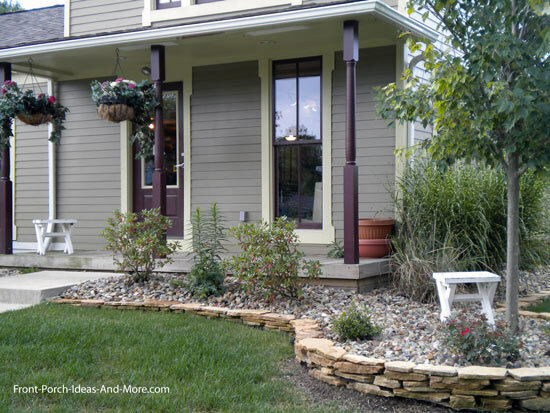 See how adding different trim components affect the overall appeal of your front porch. We also provide a diagram of all the potential components of house trim for your porch and home. You can use column wraps to change the style of your columns. Go from round to square or rectangular or vice versa. Wraps are not usually load bearing so you can't use them to support your roof in most cases. However, they can add appeal without removing and replacing your existing columns. They come in a variety of options and materials; most are vinyl or polyurethane which requires little to no maintenance and will look great for many years. Faux stone column wraps can significantly add charm to your home. 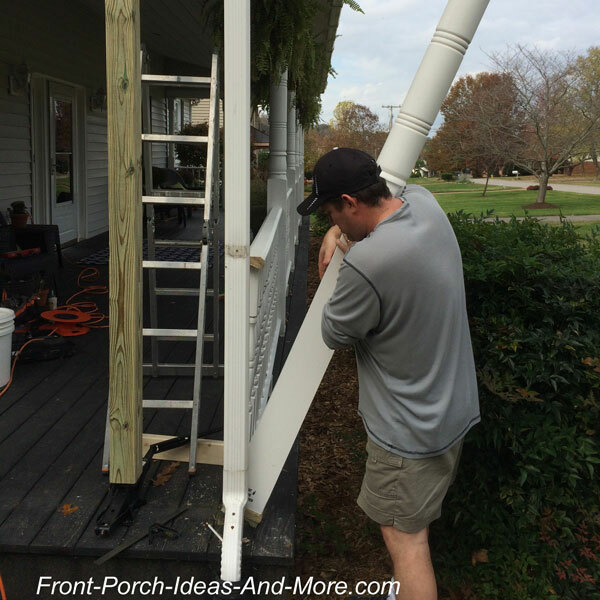 Easy to install around your existing porch columns or posts, they are weather resistant and will add a new dimension to your porch. Many come in a variety of colors too. 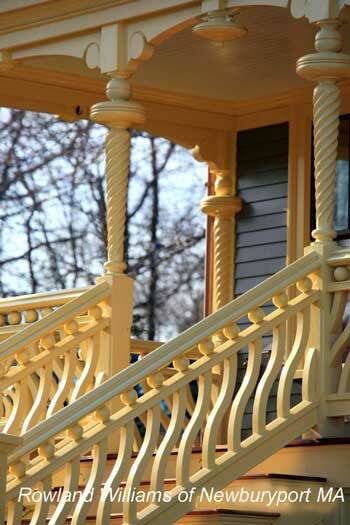 Like railings (or balustrades) you have many options for columns as well. Keep in mind your front porch railing and columns should present a cohesive look and complement your home's architecture. Most of today's columns are modeled after the architecture of the early Greeks and Romans. Let's get to it. Architectural Columns normally consist of a capital, a shaft, and a base that supports a roof or beam. They can be structural or decorative. These photos are courtesy of Worthington Millwork. Capitals: Capitals are the transition feature that connects the shaft of the column to the roof. The can often be very ornate or plain. Shafts: Shafts, or the main part of the column, can be plain or fluted and tapered or non-tapered. Gradually tapering a column on the upper portion offsets the effect, at least from eye level, that the shaft enlarges as you look up. Gotta hand it to those ancient Greeks. Bases: Bases usually come in two styles, square or rectangular and round. When used, they support not only the weight of the column but also disperse the weight (often called a footprint) on the ground. Doric: Doric columns, like those on the Parthenon and in the photo below, are fluted (original Doric columns had 20). Based on the size of a human foot, column heights are 6 times the base diameter. This gives them a stockier or heavier look than ionic columns. Ionic: Tapered ionic shafts (like the ones in the photo below) usually has 24 flutes, however; some have no flutes. Ionic column heights are normally eight or nine times the base diameter. At the top of the column is a capital with volutes that is remarkably similar to ram's horns. Corinthian: The Corinthian column is very decorative and the most ornate of architectural columns. It almost always have flutes and the capitals have one to two rows of leaves and scrolls. The base is somewhat refined. Corinthian and ionic columns are very similar; the capital being the most defining. 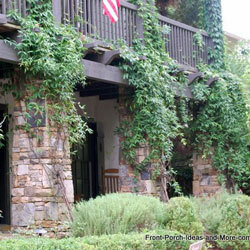 Tuscan columns: These columns are simplistic in design with a circular base. Historically, Tucson columns were used primarily in military, dock, and warehouse buildings. Romanesque: Romanesque columns are recognized for their mass, overall strength, and are usually combined with arches in the surrounding structure. Load bearing is accomplished by walls vice the columns themselves. This is in contrast to Ionic, Corinthian, or Tuscan columns. Another feature of Romanesque are arcades, or rows of arches supported by columns as in the photo below. We've listed a great resource at the bottom of the page that will help you design you own architectural columns. It allows you to select a variety of capitals, shafts, and bases to create your own unique look. 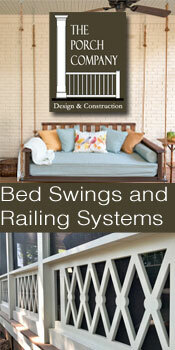 If you are contemplating building your own porch columns you need to understand load bearing capacities. I've reviewed many videos and perused numerous articles and almost all of them fail to mention load bearing requirements. The columns support not only the roof but if you live in cold climates, it also has to support loads of snow. Different column materials have different load bearing capacities. For example, a 6 inch fiberglass diameter column can support 8,000 pounds, whereas a 12 inch diameter column can support up to 18,000 pounds. Different materials have different load bearing capabilities. Another extremely important consideration is ensuring hollow wood columns are vented properly. 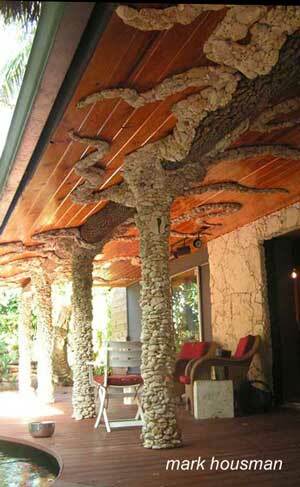 If your wood columns are not vented moisture will eventually the column will rot. Prebuilt hollow wood columns are usually open at the bottom. Do not place these columns directly on your decking but rather set them on post holders that raise the column off the floor to allow air flow. 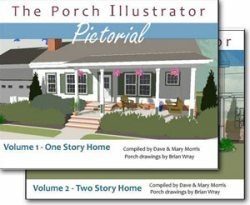 Learn about venting porch columns. We hope you found the column information you were seeking. We have additional links for you to follow below.